Controversy, especially religious controversy, was the great spectator sport of Victorian England. This work is a study of the biggest and best of Victorian religious controversies. Essays and Reviews (1860) was a composite volume of seven authors (six of them Anglican clergymen) which brought England its first serious exposure to biblical criticism. It evoked a controversy lasting four years, including articles in newspapers, magazines and reviews, clerical and episcopal censures, a torrent of tracts, pamphlets and sermons, followed by weightier tomes (and reviews of all these), prosecution for heresy in the ecclesiastical courts, appeal to the highest secular court, condemnation by the Convocation of the clergy and a debate in Parliament. Essays and Reviews was the culmination and final act of the Broad Church movement. Outwardly the conflict ended inconclusively; at a deeper level, it marked the exhaustion both of the Broad Church and of Anglican orthodoxy and the commencement of an era of religious doubt. 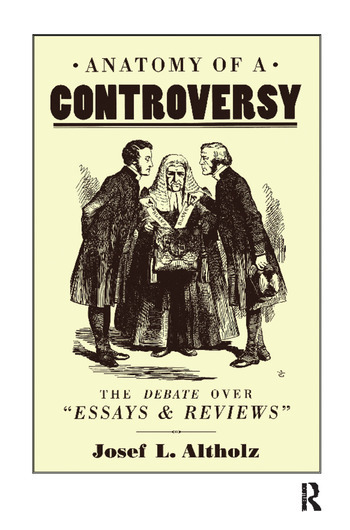 This controversy illustrates the pathology of Victorian religion in its demonstration of the propensity to controvert and the methods of controversialists. It is both the greatest Victorian crisis of faith and the best case study of Victorian religious controversy. Contents: On Controversy; Broad Church? ; The Essayists; The Essays; Early Responses; The Great Reviews; Censures; The War of the Pamphlets; Tracts into Tomes; The Case in Court; Verdict; Appeals; Acquittal; Condemnation; Aftermath; Epilogue; The Night Battle; Notes; Selected Bibliography; Index.